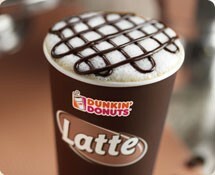 Get a free Medium Beverage at Dunkin Donuts. Sign up for Dunkin UpDDate to get a free medium beverage. Your choice of any iced or hot coffee, tea or latte, hot chocolate or Coolatta. You will also receive one your birthday. Once you complete your profile including your mailing address, they’ll mail you a coupon through postal mail.